These 3-ingredient appetizers are easy and delicious. 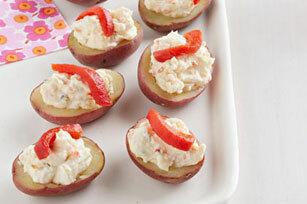 Just top bite-size new potatoes with our savoury cream cheese spread and roasted red peppers and you've got a platter of appetizers you can be proud of! Cook potatoes in boiling water in saucepan 15 to 20 min. or until tender; drain. Cool. Cut potatoes in half. Scoop out centres, leaving 1/8-inch-thick shells. Place potato pulp in small bowl; mash until smooth. Add cream cheese product; mix well. Spoon into potato shells.